Go to original pattern for design DROPS 161-26. Knitted DROPS jacket in garter st in ”Delight”. Size: S - XXXL. DROPS CIRCULAR NEEDLE (80 cm) SIZE 3.5 mm – or size needed to get 23 sts x 45 rows in garter st = 10 x 10 cm. You can get the yarn to make this pattern from	16.10£. Read more. Dec 1 st as follows: K 2 tog. Inc by working 2 sts in first st, but when inc at x, inc as follows: Inc 1 st by making 1 YO after 1 sts, on next round K YO to make hole. SIZE XL: 20, 26, 33, 39, 46 and 52 cm. SIZE XXL: 20, 26, 33, 39, 46 and 52 cm. SIZE XXXL: 20, 27, 34, 41, 48 and 54 cm. The jacket is worked in parts in different directions. Arrows on chart show the knitting direction. Work entire jacket in GARTER ST - see explanation above, back and forth on circular needle to make room for all the sts. The back piece is worked in 2 parts that are sewn tog mid back. Then work yoke from here. Cast on 3 sts on circular needle size 3.5 mm with Delight. INC ON EVERY ROW IN EACH SIDE OF PIECE WHILE DEC.
Inc 1 st at beg of every row from RS (= y – see chart) and at beg of every row from WS (= x) - READ INCREASE TIP. When inc in bottom edge (= x) is done, dec in the side (= z) as follows: Dec 1 st – READ DECREASE TIP - at beg of every row from WS. Repeat dec on every row from WS until finished measurements. AT THE SAME TIME when piece measures 3 cm along z - dec 1 st at beg of next row from WS inside 4 sts (after dec). Repeat dec every 3½ cm 10 times in total. When inc mid back (= y) is done, dec 1 st at beg of next row from RS. Repeat dec at beg of every row from RS until 3 sts remain. Cast off. Work as left back piece but reversed. I.e. all dec/inc explained at beg of row from RS are now done at the beg of row from WS and vice versa. Sew tog left and right back piece mid back in outer loops of edge sts. The piece is worked back and forth in garter st until finished measurements. Pick up (from RS) 1 st in every ridge on back piece - see dotted line on chart (same as on front piece). On next row adjust no of sts to 96-106-116-128-142-156. Cast on 1 st at the end of the next 2 rows (= edge st) = 98-108-118-130-144-158 sts. Continue to work until piece measures 3-4-5-6-7-8 cm from where sts were picked up. Cast on 6-2-11-7-13-9 new sts in each side for sleeve. Then cast on in each side on every other row: 5 sts 7-7-5-5-3-3 times and 12 sts 1 time = 204-206-214-218-224-230 sts. When piece measures 17-19-21-23-25-27 cm from where sts were picked up, cast off the middle 36-38-40-40-42-46 sts for neck. Finish each shoulder separately. On next row, cast off 1 st towards the neck = 83-83-86-88-90-91 sts on each shoulder/sleeve. Work until piece measures 21-23-25-27-29-31 cm from edge where sts were picked up. Sleeve opening measures approx. 14-15-17-18-20-21 cm - loosely cast off. Work front piece diagonally (as right back piece + band), i.e. 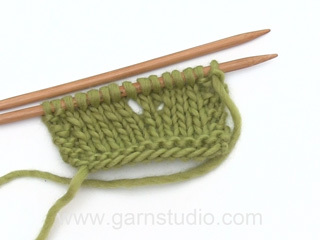 work as follows: Cast on 10-10-10-10-11-11 sts (= 3 sts + 7-7-7-7-8-8 band sts) on circular needle size 3.5 with Delight. Work as RIGHT BACK PIECE, but inc before the last 7-7-7-7-8-8 sts from WS (= band). NOTE! When dec from RS beg, cast off these 7-7-7-7-8-8 band sts. Worked back and forth in garter st. Pick up (from RS) 1 st in every ridge and 1 st in every band st in waist – see dotted line on chart. On next row adjust no of sts to 55-61-65-71-79-86. On next row cast on 1 new st in the side (= edge st) = 56-62-66-72-80-87 sts. Continue to work until piece measures 3-4-5-6-7-8 cm from where sts were picked up. Cast on 6-2-11-7-13-9 new sts at the end of next row from WS for sleeve. Then cast on in the side on every other row: 5 sts 7-7-5-5-3-3 times and 12 sts 1 time = 109-111-114-116-120-123 sts. Continue to work until piece measures 11-13-13-15-15-17 cm from where sts were picked up. Now cast off 18-18-18-18-20-22 sts towards mid front for neck. Then cast off on every other row towards the neck 2 sts 4-5-5-5-5-5 times = 83-83-86-88-90-91 sts remain on row for shoulder/sleeve. Work until piece measures 21-23-25-27-29-31 cm from where sts were picked up, adjust according to back piece. Loosely cast off. Cast on 10-10-10-10-11-11 sts (= 7-7-7-7-8-8 band sts + 3 sts) on circular needle size 3.5 with Delight. Work as LEFT BACK PIECE - NB! The inc are now made after the first 7-7-7-7-8-8 sts from RS (= band). Remember BUTTONHOLES - see explanation above. Work as LEFT YOKE but reversed - i.e. cast on sts for sleeve at the end of row from RS. Sew shoulder/overarm seams edge to edge to avoid a chunky seam. 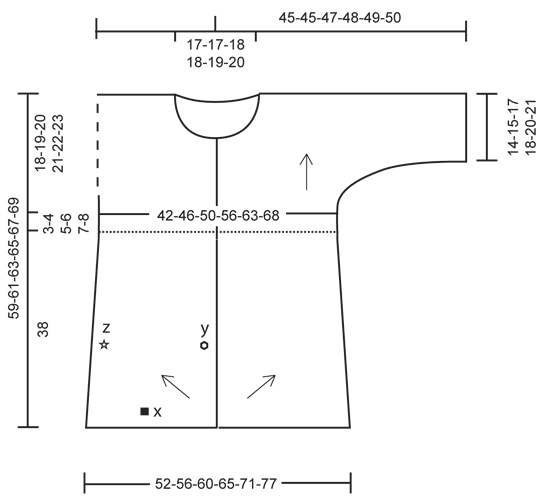 Sew side and underarm seams in one inside 1 edge st. Sew on the buttons approx. 1 cm from edge on left band. Pick up from RS approx. 106 to 129 sts around the neck on circular needle size 3.5 mm with Delight. Work 3 ridges back and forth and then loosely cast off with K from WS. Vielen Dank für die super Anleitung. Habe diese Jacke gestrickt und es passt einfach alles und sieht klasse aus. Die Anleitung ist korrekt, die Ärmel werden auf diese Weise angestrickt. Sie schlagen beim Rückenteil beidseitig in jeder 2. R (also am Ende jeder R) die genannte Anzahl M an, um die Ärmel zu bilden. Im Video "Seitlich neue M anschlagen" (im Kopf neben dem Foto zu finden) können Sie sich noch einmal anschauen, wie das funktioniert, falls Sie nicht sicher sind. Vasemmassa etukappaleessa pitäisi nurjan puolen lisäys olla reunuksen seitsemän silmukan jälkeen, eikä ennen seitsemää viimeistä, kun kerran aloitetaan 3 silmukkaa plus 7 reunusilmukkaa oikealla puolella. Alku näytti vaikealle, en osannut hahmottaa, miten vasemman takakappaleen sivuista (y) voi muodustua oikein mittaiset mutta nyt molemmat takaosat valmiina, juuri oikeissa mitoissaan. Mutta neulomaan jouduin pöyröpuikolla 2.5 cm, muuten ei onnistunut. Ich habe jetzt das Rückenteil fertig gestrickt. Auf dem Bild sieht es auf der Vorderseite so aus, als ob die Kante in der Mitte unten gerundet ist. In der Beschreibung steht dazu nichts, es soll wie das Rückenteil gestrickt werden. Wie bekomme ich die Ecken rund? Es gibt keine andere Rundung als die vom Rückenteil. Durch die Blenden, die diagonale Art des Strickens und dadurch, dass Sie die Vorderteile in der Mitte ja nicht zusammennähen, fällt die Jacke so wie auf dem Foto, also etwas "rund", eine wirkliche Rundung ist jedoch nicht vorhanden. Bonjour Frédérique, suivez bien les instructions en regardant les indications du schéma (flèches et lettres) - pour toute assistance personnalisée à la réalisation de ce modèle, merci de vous adresser à votre magasin DROPS ou au forum DROPS. Bon tricot! Koossa L alareunan x lisäykset loppuvat ennen takakeskiosan y lisäyksiä, onko se oikein? Aloitanko heti kun alareuna on 30 cm pitkä kavennukset, vaiko vasta, kun takakeski on 38 cm pituinen? Ihana malli muuten! Olet neulonut aivan oikein. Nyt kun alareunan lisäykset on tehty, voit aloittaa kavennukset. Super le jeu des rayure.j'adore.